Whether you keep it for yourself, give it away during the holidays, or sell it on eBay, you can win an Apple Watch in October and it’s SUPER EASY! All you have to do is refer new clients to my business! Each time a new client lists you as the reason they came to me, you get an entry. I’ve had FREE CLASS postcards made for you to pass out – the studio schedule and contact info is listed AND there’s a spot for you to write your name in. Pick some up the next time you come to class! The postcards make it super easy, but you don’t need them to participate. Everyone wins in this contest, because every new referral is also worth $5 in rewards points to your Fitness with Rachel account. So tell your co-workers, friends, neighbors, postal worker, book club members, family, the person behind you in the check out line at the grocery store, etc! Not-so-fine-print: A new client is considered anyone who hasn’t attended any of my classes, ever; truly a new client. The contest runs Oct 1-31. 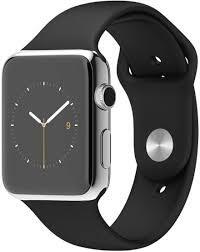 Apple Watch is Sport 38mm 1st version, as pictured above, worth $269. Every referral gets you one entry into the raffle (so refer lots of people to get more chances to win), the drawing will be held Nov 1st, 2016. Your name MUST be provided by the new client either on their new client paperwork, or via the free class postcard.